Didn't quite go as predicted, did it? Whilst Nostradamus has never truly threatened to dislodge Paul as my middle name, I had approached the season with the blind optimism of a bespectacled maths nerd with an unfortunate facial complexion inviting the class hottie out for a date. A county boasting such strength in depth as Warwickshire would find it difficult to finish outside of the top one; of that I was almost certain. Others of greater renown held a similar opinion. But we were all deceived. My castigation of the top order has been well documented throughout the course of the season, and the latter half of the campaign saw the lingering shroud masking its deficiencies blown away. Injury befallen by the likes of Tim Ambrose and Rikki Clarke left the batting looking about as clever as a Worcestershire quiz contestant and confirmed what many had long suspected: Warwickshire need to replace at least one of their top three batsmen. Meat Loaf might think two out of three ain't bad, but I'm telling you that invariably being one or two down for not very many ain't good, either. For a year laced with disappointment for Bears fans, it has not been without its successes. Keith Barker - who finished the season with the extraordinary record of having taken at least three wickets in the first innings of 10 of the 11 Championship games he played - delivered some of the finest spells since Albus Dumbledore engaged Lord Voldemort in a vigorous bout of wand twirling at the Ministry of Magic. To have extracted 102 Division One wickets at less than 22 apiece across the last two seasons is quite remarkable, and only adds to the befuddlement at Barker's continued absence from England's performance squads at the very least. While Evans served notice of his own prowess in last year's Friends Life t20 competition, Javid has quietly found himself encumbered with the responsibility of walking in at first drop. Averaging 44.21 from No. 3 at the age of 21 is a mighty impressive feat. Those statistics, including two centuries against strong Somerset and Surrey attacks, surely signal an end to the perennial disappointment that is William Porterfield as a viable four-day selection. He has proved less reliable than the captain of the Costa Concordia since putting pen to paper on a new contract last year. Quelle surprise, it looks like we've missed out on Jos Buttler. What was it about a side notoriously inept in all forms of limited overs cricket that dissuaded him, I wonder? In truth, he never really suited us anyway. Tim Ambrose is a more polished wicketkeeper, and Buttler is a rumbustious blade swisher awash with boundless talent; he's about as far away as it gets from the sort of Rocky themed, rags-to-riches story that Warwickshire so love to fashion. There are few fears over our four-day capabilities - a lot less rain and a little more luck might have seen the Championship trophy continue to gather dust at Edgbaston - but limited overs performances have nosedived into seemingly terminal decline. The first corrective measure should be to import an additional overseas gun for T20. It would put backsides on seats, add a badly lacking panache to proceedings and at the very least show that we take the format seriously. If the current ideology is persisted with, I'll be anticipating with interest the announcement of a significant reduction in ticket prices to bring them in line with the quality of cricket on show. 2014 is an important year for Warwickshire. Dougie Brown's settling in period is over; there will be great expectation. Brown is blessed with arguably the strongest bowling attack found in all the shires, and need only add a solid batsman or two to cement what would present a formidable opponent to any opposition. Luck will play its part, as it so often does in English domestic cricket, and it shouldn't be forgotten that Warwickshire were often thwarted by the elements when victory looked assured - Headingley being exhibit A. That said, the sedate brand of cricket so often employed in the early part of the season is of equal blame. Where Durham and Yorkshire deployed innovative fields, scored with abandon to squeeze every batting point from an innings and were bold in declaration, Warwickshire often exercised caution. 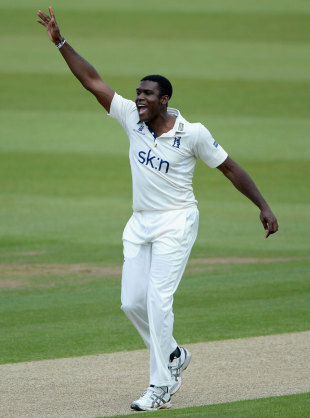 That is not disparage Jim Troughton, who is an inspirational captain in so many ways, but more an approval of the attacking methods of Varun Chopra - surely Warwickshire's next captain after excelling in a role thrust upon him midway through the year. It wasn't always enterprising, but there were moments to cherish. Chris Wright tearing through Durham at Edgbaston, Barker swinging it like King Louie, Evans strutting about the crease and the continued meteoric development of Chris Woakes' batting. This is a squad boasting some magnificent cricketers, and Brown must now see to it that the next potential golden age of Warwickshire does not falter. This is too good a side to go empty handed for long.